Photographers know very well that dawn and sunset light is magical. Technically the subject of this photo is a repository of manure with a few surrounding trees: can you imagine anything less poetic? I was near the village of Caille (Alpes-Maritimes, France) and the valley was mostly in the dark, while the sun light filtered through a opening between the mountains. I under-exposed a bit and post-processed for making shadows even darker, so the trees stand out as golden jewellery on an almost completely black background. 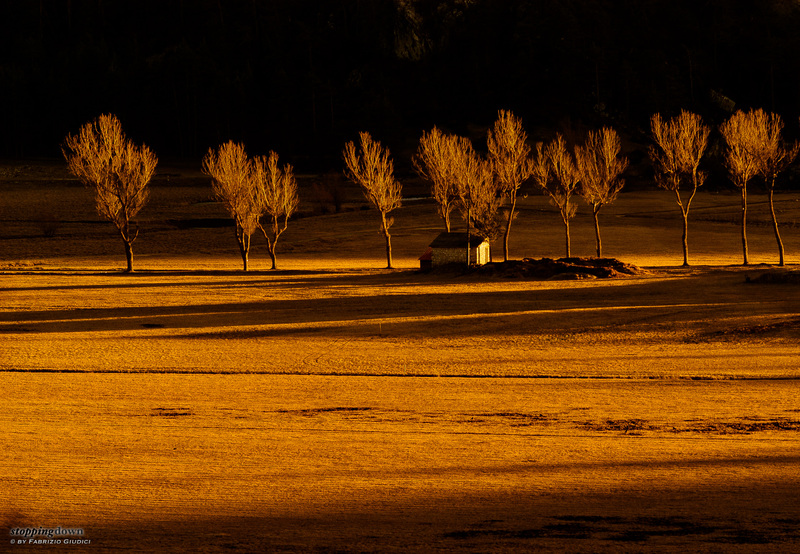 Trees in the golden light. Nikon D100 + AF 180 f/2.8D, 1/320 sec @ f/5, -2/3 EV, Auto ISO @ ISO 400, hand-held.